Camp Bagong Diwa political prisoners: Justice for Bernabe Ocasla! Free all political prisoners! Thirty-six (36) political prisoners in Camp Bagong Diwa, Taguig City today wore black armbands to express their grief and indignation over the death of political prisoner Bernabe Ocasla on November 28 at the Jose Reyes Memorial Hospital in Manila. At 5:30pm yesterday, 66-year old Ocasla, a peasant organizer, suffered his third and fatal cardiac arrest since Friday, November 25, when he was first brought to the hospital. He died instantly, after three days in coma. “Accountability on the death of political prisoner Bernabe Ocasla lies squarely on the Government of the Republic of the Philippines. Instead of immediately fulfilling its commitment to release all political prisoners, especially the ailing and elderly political prisoners, the Duterte administration, through its GRP peace panel, have spewed mere rhetorics instead of actually releasing them. We express our condolences with the family of Bernabe Ocasla. 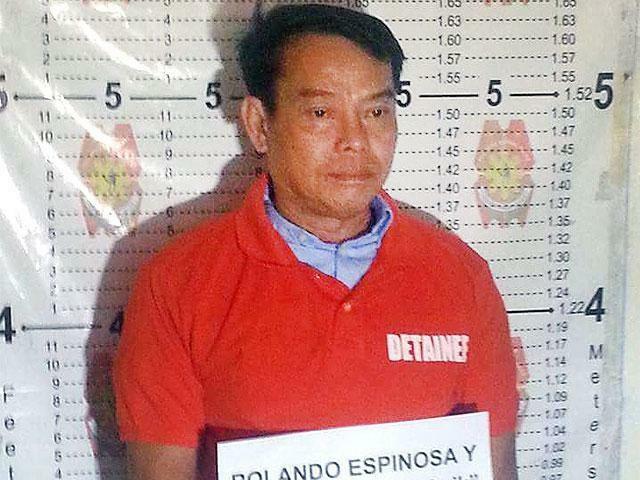 We mourn for yet another political prisoner who died in detention, because of the State’s continuing injustice against them,” said Cristina Palabay, Karapatan Secretary General. “How many more ailing political prisoners will end up in life threatening conditions before GPH fulfils its commitment to release all political prisoners?” Roneo Clamor, Karapatan deputy secretary general, said. "Enough of the delays, enough of the injustice, let all political prisoners be united with their loved ones," Roneo Clamor, deputy secretary general of Karapatan said in front of the Office of the Presidential Adviser on the Peace Process (OPAPP). “OPAPP should immediately work for the release of all political prisoners without excuses and deliberate misinformation,” Clamor said. Political prisoners from Caloocan City Jail, (CCJ) Emmanuel Bacarra, Billy S. Morado, and Felimon S. Tuba wrote a letter to Norway’s Foreign Minister Borge Brende as the latter is scheduled for a country visit starting today, November 22, to November 25. “After granting absolute pardon to actor Robin Padilla, we hope Pres. Rodrigo Duterte will do the same to wrongly convicted political prisoners (PPs) especially those who are ailing, elderly and the women,” Karapatan Deputy Secretary General Jigs Clamor said. “Twelve years after, justice remains elusive to the seven victims of the Hacienda Luisita massacre, to the more than a hundred farmworkers and their families who were shot and injured during the bloody dispersal of the farmworkers’ strike, and to the thousands of farmers and farmworkers who are defending their right to decent and living wages and the right to reap the benefits of the land they tilled for decades. The case of Hacienda Luisita is one of the foremost examples of impunity in the Philippines,” said Cristina Palabay, Karapatan Secretary General, as Luisita farmers today led protest and commemoration activities in Tarlac. Rise Up! for people’s rights, Stop drug-related killings! Karapatan today expressed its support for Rise Up!, a campaign initiated by faith-based groups, institutions and people’s organizations against the drug menace and for the protection of human and people’s rights against drug-related extrajudicial killings, as it holds a public forum and launch today at the Iglesia Filipino Independiente (IFI). On the Int'l Day of Imprisoned Writers: Free the artist! Free all political prisoners! As PEN International, a worldwide association of writers, commemorate the 35th year of the Day of Imprisoned Writers today, Karapatan reiterated its call to the Duterte administration to release all political prisoners, including writers and artists among them. “Amid reports of violations of human and people’s rights, Pres. Rodrigo Duterte is treading on dangerous ground with his plan to suspend the privilege of the writ of habeas corpus. Such suspension can be conveniently used by the military and police as justification for more abuses,” stated Cristina Palabay, Karapatan Secretary General, today after Duterte’s remarks over the week-end. “Military operations in communities through Oplan Bayanihan and the consequent human rights violations that come with every operation continue. If President Rodrigo Duterte is indeed serious in his peace initiatives, he should rein in the Armed Forces of the Philippines from its vile efforts to sabotage the GRP and NDFP peacetalks, order his troops to pull out from the communities and abandon this counter-insurgency program. If these military operations continue, any ceasefire declaration from the GRP will be seen as a mere PR stunt,” Cristina Palabay, Karapatan Secretary General, said today as the organization continues to receive several reports on rights violations in line with Oplan Bayanihan. Pres. Rodrigo Duterte’s presumption of regularity in the operations of the Criminal Investigation and Detection Group (CIDG), which resulted to killing of Albuera Mayor Ronaldo Espinosa and Raul Yap, signals the outcome of any independent, much less official, probe on the incident. Such statements will be taken as a go-signal for the exoneration of the CIDG and the masterminds of the killing. Such statements fuel impunity, granting credence and legitimacy to every police action in line with the war against drugs. Karapatan Alliance for the Advancement of People’s Rights - Philippines calls on Turkey President Recep Tayyip Erdogan to immediately release pro-Kurdish People’s Democratic Party (HDP) leaders. On November 4, HDP Co-chairs Sellahatin Demirtas and Figen Yuksekdag were arrested along with nine other members of the parliament as part of the crackdown against members of the opposition party. The Erdogan regime used the July 15 failed coup as a pretext to arrest the leaders of the Kurdish people saying they were behind the coup. We condemn the nine Supreme Court justices for their abominable decision allowing a hero’s burial for the dictator Marcos. We also denounce the regimes after EDSA 1, from that of Corazon Aquino to Benigno Aquino III, which failed to hold the Marcoses and their cronies accountable for rights abuses, corruption, and anti-people policies. These US-backed governments enabled the political rehabilitation of the Marcoses. The nine Supreme Court magistrates have betrayed the martyrs and heroes who suffered and died at the hands of state security forces of a tyrannical dictatorship. The nine Supreme Court magistrates have betrayed the whole Filipino nation and our history. Karapatan secretary general Cristina Palabay clarified that there have been only nineteen (19) political prisoners released in line with the GRP-NDFP peacetalks, and not 71 as stated by Peace adviser Jesus Dureza, in an article of Cebu Daily Inquirer on October 31, 2016. "Majority of those released are consultants to the peace process. NDFP consultant Jaime Soledad was acquitted from the fabricated charges against him, and political prisoners discharged from prison from July-October 2016 were released because of the merits of their counsels' defense and the campaign for their releases," Palabay explained. While Karapatan welcomed recent reports on the upcoming release of at least 50 political prisoners, Palabay reasserted that all the 400 political prisoners should be released at the soonest possible time. "We shouldn't wait for Christmas to do what is compassionate and just, especially for the elderly, sick, women and minors, and those languishing in jails for more than ten years," she stated.